This posting completes the following three postings: On Positive Living, Destiny, & Superstition plus On Positive Psychology and Holon Physiology, and Formula for Bio-Quantum Technology. I want to remind the reader again regarding this Website’s definition of Reality, as again stated below. 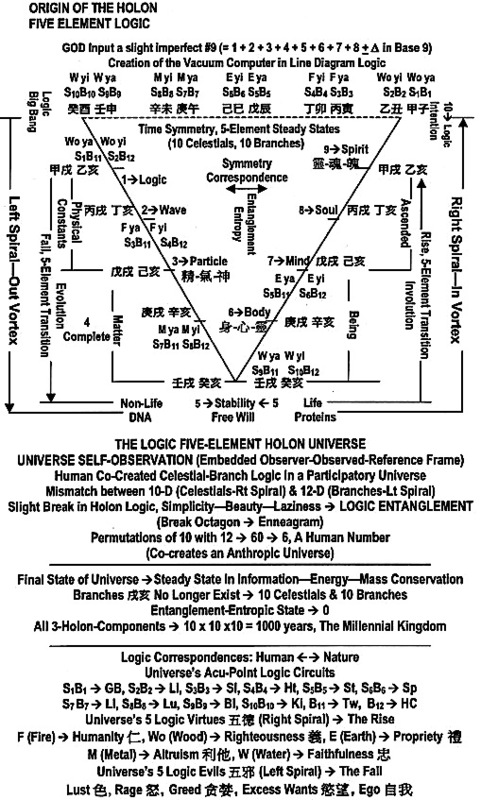 In addition, the Holon of Stems—Branches—Five Elements satisfy this definition of Reality and this Reality is the Universe’s Self-Observed Reality Co-Created and encoded in the Vacuum Computer. Reality is Created with the Observer—Observed—Reference Frame, even the Observer does not know what is his, hers, or its reference frame. As long as this reality is self-consistence inside the observer-observed box and has no conflict with the boundary of its reference frame, this reality can be used to “co-create”. The key has to do with the phase, “no conflict with its reference frame boundary”. Now, if this reality is in consistent with the one created in the Vacuum Computer, then the free-will field will not affect it, unless the free will is intentional or unintentional on newly created reality not yet learned by Nature. The Universe’s Self-Observational Reality is presented in the following mandala formula. In addition, The Yin of 5-Elements represents the Virtues from the receiver’s end, and the Yang virtues from the giver’s end. 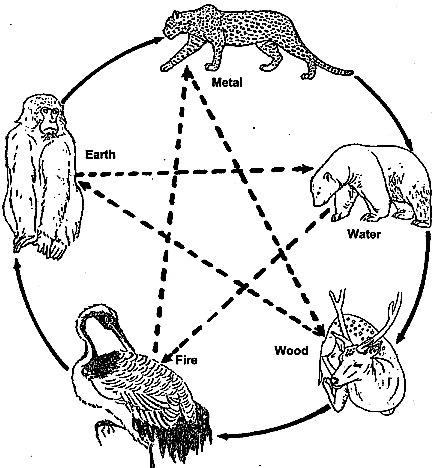 Likewise there are the Yin-Yang 5-Elements of the Evil aspects. The sets of Yin and Yang are the Virtue-Evil Holons of the Observer—Observed—Reference Frame. These Holons generated many shades of virtual and evil colors. The following is one set of these shades of colors. Notice, these Virtue—Evil Sets are sets generated by the Love-Hate Relationships, namely the 10 coordinates embedded in the Enneagram. shown in the next diagram. It is the 10 coordinate set hidden in the 10—22—27 formula. and their corresponding anti-particle set. In fact, there is one and only one steady state color set (the Ascended Set) of Love-Hate. This is color of Pure Love. 5-Element Logic is also popular in Western Culture. For example, the Greek elements seem to go back to the beginnings of the pre-Socratic school. There are four elements, Earth, Fire, Air and Water as well as a fifth, the Aether. This connects with the five solids in geometry. Thus, following the notion of a Participatory Universe, and as far as I can tell there are no conflicts within this principle and within the reference frame, which is the Universe itself. This 5-element model had been learned by Nature and it is definitely a part of Nature. Examples of a few more important correspondences: Heart–> Tongue, Gum; Liver –> Sinus; Lungs –> Nose; and on Exercise according to the 5-Element diagram below. Exercises developed based on the above diagram have been developed and tested with positive results in health corresponding to the respective organs. Developed are both the Yin and Yang Exercise of these animal movements (see Yin-Yang Symptoms discussed below). 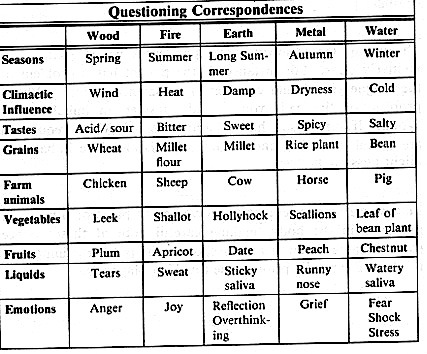 Continuing with the correspondence table. There are many more correspondence tables on the Internet. 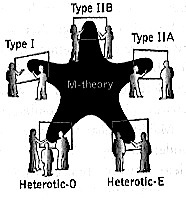 In fact, M-Theory is composted of Five Connected Strings, as shown below. Notice, the state of Mind-Soul Vision/Feeling is what today’s popular concept Right-Brain Positive Thinking (e.g., the Silva Method that calls for 1-Relaxation and Quietude, 2-Focus, 3-Visualization, 4-Intent, 5-evocation). Again the number 5 is connected to the Five-Element Principle. These five steps at best are the vary beginning and incomplete in the act of Knowingness. This incomplete state explains why today’s positive thinking techniques does not work. What is missing is the learned knowledge, the particular vision, or the particular knowingness. The following are Positive Thinking techniques (to prevent illnesses) that works, at least for my sister, my wife and I. The Five Silva Steps are preliminary to integrate into what I am about to formulate. Let us first deal with day-to-day emotional problems. Did you ever “look at a mirror” and honestly “see” the good, the bad, and the ugly of you. Most people only see the good. Map the Mirror image of you with the 5- Virtues or the 5-Evils (stated in the above 1st diagram) in you. The extent to which you satisfy each of these Virtues on not (or the controls of 5-Evils in you) determines the good, the bad, and the ugly you. Below are the five steps. Study the 5-Virtues (or the 5-Evils) carefully and map their correspondences to the 5-Organs via the 5-Elements. 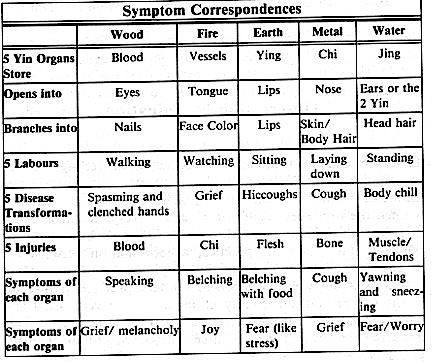 These Organ correspondences that cause your emotions. These Virtues must be reviewed each day, so you can master their meanings and their connections to their corresponding Organs. At night, make a list of all events or things that disturbed you during the day. Study what this Virtue list teached you. Pay particular attentions to those items that “really disturbed you”. All emotional disturbances are symptoms from “Nature”. Remember the Virtues are the “Virtues of Nature” and you are a member. Destroy this list, and start over with another list the next night for the next day, even though the next list contains all or part of today’s list. Continue until all or most of the items are new, which implies that you have learned to satisfy the old list of Virtues and begin playing the with new Virtues. If you do this night in and night out, you will resolve most of the emotions that disturb you. Notice, you will be free of disturbances; but try to keep it in a steady state so you don’t become ill from them. Furthermore, if all of us humans (or humanity) follow these 5-Virtues, Physical Nature will also automatically follow these 5-Virtues: there will be a Mass-Ascension. Besides the first Four Commandments, the other six are more than covered in the Virtue—Evil lists. While the first Four Commandments are about God’s Love, pure love, ascended love, or the steady state of love-hate (because of free wills). All these Virtue—Evil Sets, including the Ten Commandments are teachings to satisfy the Holon of Sageness Within—Kingliness Without—Godliness in Self. Therefore, for the above steps to work, one needs to understand the Virtue’s characteristics plus their connections to each other. Perform a Google search to learn these Virtues and their variations. Listen/Feel the Symptoms: Symptoms appear often. Take pecial notice before they physically appeared. I always said, Your Heart is talking to you with Symptoms . Listen and talk back (i.e., by responding with remedies, Homeopathic—Acupuncture—Herbs and even with the Yin or Yang Crane Exercises for Heart Symptoms). Map Organ Correspondences to Symptoms (see Diagram 1 above), e.g., if you have problems with your Gums, the problem may be because of foods stuck between your teeth. This Symptom mapped onto the Organ of the Heart. Knows the constitution of your Yin or Yang Organs. Notice, it is important to know that your Symptoms have a Yin or Yang nature in reference to you. This is the most difficult step because most often the Symptoms for Yin and Yang are identical. In our example of the Gum, for most people this is a yang Symptom and needs to Sedates the Heart. Notice, all problems with teeth are from disharmony between the Heart and the Kidney. Treat Symptoms with Yin or Yang Remedies Corresponding to Organ Constitution. Notice, the Yin or Yang Remedies for Organ Symptoms (or illnesses) are almost never addressed in health books (or even by most Practitioners) because the Yin or Yang is individually dependent and they are almost identical in Symptoms. To separate the Yin or Yang nature of these Symptoms, you need the expertise of a very good Psychic Pulse Reader. Treat Side-effects by going back and repeating these steps and Side-effect Symptoms. There could be A delay effect. These five steps are automatically generated on the monitor of the WebHealth Computer. In fact, one is able to learn one’s Organ Constitution from this WebHealth Computer and then proceed almost (above 80%) without the Computer’s printout. Presented up to now is is the concept of thinking/feeling with learned knowledge. This is only the Learned Knowledge Component. There are the Brain-Soul and Brain-Spirit Components not treated in this Post. For an introduction to the Brain-Spirit Knowingness Component, see the posting, On Wing Pon’s Being Experience. The How To for two components will be presented in a future Posting.